Gladys Berejiklian celebrated an unprecedented historic win this weekend, in a huge blow to the Labor Party, who lost its third election in a row. 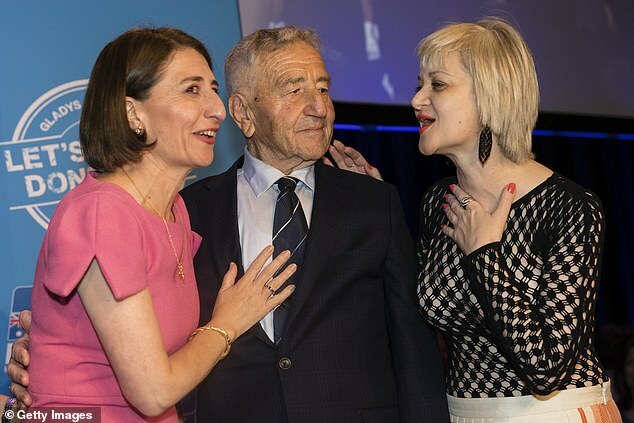 The NSW Liberal Party had a lot to celebrate on Saturday as Gladys Berejiklian became the first ever woman elected as Premier in NSW. 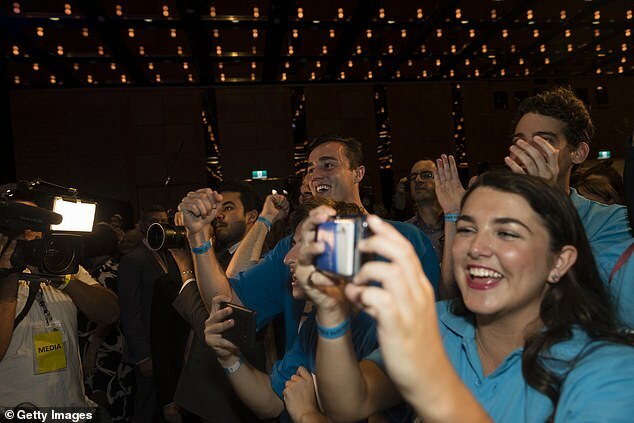 Supporters of the Liberal Party lit up the room, cheering as Ms Berejiklian secured the win and is set to retain their position as a majority government. 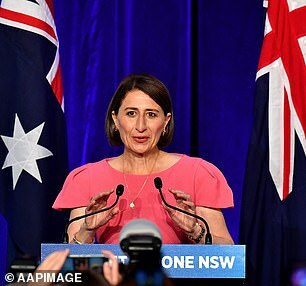 ‘A state where someone with a long surname and a woman can be the Premier of NSW,’ she said after proclaiming victory. The newly reinstated premier was joined on stage by Prime Minister Scott Morrison who spoke highly of Ms Berejiklian and her ability as a hard working Liberal leader. She also made sure to invite her family to stage, thanking her sister and father several times throughout the night. ‘For the first time in nearly half a century the people of NSW have seen as fit to give us a third term,’ Ms Berejiklian said. She also promised to work closely with the three independents ‘whether or not my government is a majority or a minority government’. 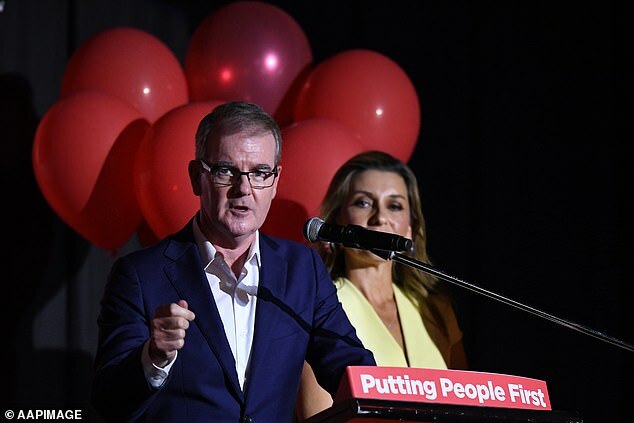 Labor leader Michael Daley spoke a more sorrowful tone to his party room when he conceded defeat to a shattered crowd of supporters. While the party raged in the Liberal supporters room, Labor supporters set a more somber tone for the night. 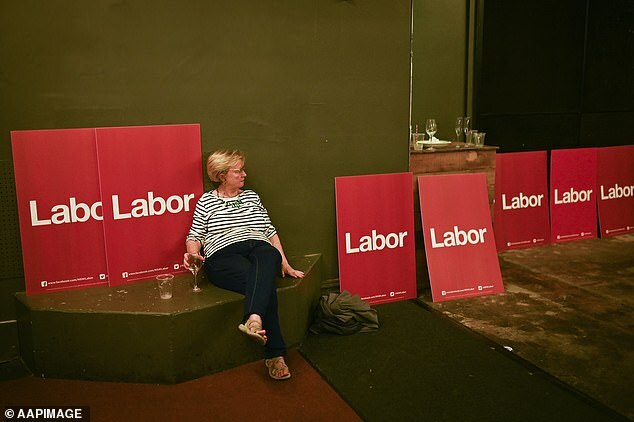 In an image that sums up the heartbreak, one woman can be seen sitting alone, slumped against a wall surrounded by discarded signs with a glass of wine in her hand. The defeat was difficult for the Labor Party as they faced their third straight loss with some analysts predicting the defeat just after 8pm. The party leader said he was very disappointed at the result in which the party struggled to gain seats. The newly appointed leader said the 134 days he has served as Opposition Leader was not enough time to guarantee success at the polling booth, but that he would not be stepping down. ‘I thought that would be enough time to get across the state,’ he said.